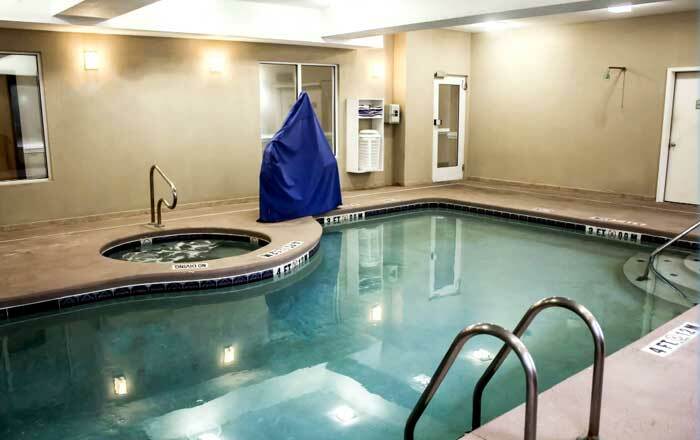 Yearround Indoor Heated Pool and Spa. Our warm and welcoming staff want to help you get ready to take on your day at our Comfort Suites® hotel in Brunswick, GA, conveniently located near the Golden Isles of Georgia, Summer Waves Water Park, College of Coastal Georgia and Golden Isles Speedway. Get going with a great breakfast. Start your trip to Brunswick with our free hot breakfast offering everything from eggs, waffles and meat to healthy options like yogurt and fresh fruit. Our inviting guest rooms give you all the amenities you need to physically and mentally refresh with microwaves, coffee makers, hairdryers, desks, flat-screen TVs, irons, ironing boards, safes and sofa sleepers. Keep your electronic devices charged with the recharge device including AC and USB outlets provided in all guest rooms. The Comfort Suites hotel in Brunswick gives you more of the space you need to spread out, relax and get work done. Book a room today! Activities : Although the ocean is one of the biggest attractions for visitors to Georgia's Golden Isles, there are numerous other activities to enjoy during your stay in Historic Brunswick , St. Simons Island , Jekyll Island , Sea Island or Little St. Simons Island . Casinos : Hop aboard the Emerald Princess cruise ship where 200 sleek feet and four fun-filled decks await! Dining : We're a sunny little joint that's big on friendliness and fresh flavors. Our restaurant is located in Historic Downtown Brunswick, Georgia. Golf : From the mainland to the islands lie 180 holes of golf on some of the country's most spectacular and widely acclaimed courses. For those who love the game of golf, few places can quicken the pulse quite like the Golden Isles of Georgia. Government :The vibrant city of Brunswick which rises along the southeastern coastline of Georgia is one of the most unique, historic and visually stunning places in the world. Charming nineteenth century Victorian-style homes, century old grand oaks, endless golden marshes, old magnolia tree lined streets and magnificently preserved buildings complement the bustling business community of boutique shops, fine and casual restaurants, art galleries, banking and financial institutions, quality care medical centers, churches and cultural venues. Hospitals : The Southeast Georgia Health System Brunswick Campus is located in Georgia's Golden Isles, mid-way between Jacksonville, Florida and Savannah, Georgia. It is anchored by a 316-bed hospital with more than 300 physicians on its medical staff representing nearly every major medical specialty. The Health System serves as the regional medical center for residents of eight counties in Southeast Georgia. Shopping : From quaint shops to outdoor markets, designer labels to unique Georgia souvenirs, the Golden Isles has something for everyone. For guests hunting for the perfect treasure, visit area art galleries and antique stores. Local outfitters and surf shops provide equipment and knowledge for outdoor enthusiasts. Chic boutiques and outlet stores are the ideal place for a fashionista to shop the day away. University : Located on the southeast Atlantic coast in Brunswick, midway between Savannah and Jacksonville, Florida, the College of Coastal Georgia is an undergraduate college in the University System of Georgia. The College provides an affordable and interactive education in the natural beauty and abundant sunshine of Georgia's Golden Isles, an area noted for world-class golf courses and resorts as well as amazing diversity of maritime habitats, wildlife and sea creatures.